One of the interesting side effects of the golf course boom of the 80’s and 90’s has been the response of many of our older golf clubs. Recent and rapid developments in golf equipment have highlighted many of the weaknesses of these courses. This, coupled with what I believe to be a greater awareness of golf course architecture and its principles, has led many golf clubs to re-assess the playability of the course, both from the point of view of the modern day player as well as questioning the inadequacies of the original construction. Another aspect of renovation is the opportunity to correct the many years of changes made by “in house” committees and other well-intentioned administrators. Particularly in the 70’s and 80’s it seemed almost incumbent upon committees to make alterations to a course. Some well used bunkers were removed and others constructed – often with no regard to style and design. As a result some golf courses have six or seven different types of bunkering and the whole effect is a mish mash of ideas and values. Further, mass coniferous planting was often undertaken with little thought to any long term planting strategy. These mistakes now need to be corrected. Golf has changed dramatically over the past 15 years let alone the past 100 years when many of our older courses were first built. But how does one combine the new with a respect for the old? A difficult question whose answer may vary from course to course. For example many of our older courses have an abundance of approach bunkers, but should they all be removed purely to reﬂect modern design – surely not? Equally some greenside bunkers, designed to catch the long iron/wood shot are now often redundant, except of course for the high handicap golfer. These can certainly be moved without altering the feel of the course. 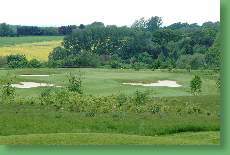 The playing characteristics of a golf ball now demand greater protection of the green than used to be the case and minor changes such as this can add greatly to a restructuring of the course whilst not affecting its individuality and special charm . Some courses have suffered major changes, and I can think of one course in America, originally built by D.Ross that changed so dramatically it led to calls for the preservation of our historic courses, and societies were formed with the express aim of safeguarding these historical golfing landscapes. Reconstruction in particular of greens, and to a lesser extent tees and fairway bunkers is an emotive subject and probably needs a specific response rather than in a general article on golf course architecture. However, no one can deny that speciﬁcations have improved enormously over the years and that these newly constructed greens and tees remain playable for much longer than the ones they have replaced. Equally I ﬁnd discussions on maintenance of a difﬁcult subject and one fraught with preconceived ideas. How many courses built in the 1900’s to 1930’s were characterised by “chocolate drop” mounding that, with most current stafﬁng arrangements, is now impossible to maintain? But do they warrant removing altogether solely to make maintenance easier? Equally, how does one reform old bunkers with mounding and lips raised by years of sand blast? They are often interesting features but invariably impossible to maintain. However, to remove the lip and associated moundwork altogether is too dramatic a solution. Too often I have witnessed extreme changes that have resulted in dull, simply shaped featuring which is often more reﬂective of a basic municipal course rather than a highly regarded and historically well designed course. The current climate of analysis should allow for a complete reappraisal of a golf course, providing an opportunity to bring the course up to date and providing a blueprint that will last for many years to come. Such reports should address the entire course, the size and condition of tees; the position, size and maintenance of bunkering; the shape, size and overall construction of greens; the tree planting and environmental and ecological value of the course. It is a document that needs to be discussed and supported by the whole club. One always hears the old cliché of a golf club representing 500 golf course architects and of course that is true, but this is a reﬂection of the personal interest each member takes of his or her course. Equally there may well be instances where an architect is not aware of certain sentimental features of the course, which would only be highlighted by discussion with the membership. The art of renovation is by its very nature a different discipline to the development of new courses. With new courses the architect will tend to impose his own views of design onto the site using current speciﬁcations and approaches. Not so with older courses. A respect of the previous architect’s philosophy and style, an understanding of the memberships requirements and a greater appreciation of the minor intricacies of the site will dominate the thoughts of the course architect. Proposals to enlarge tees to modern sizes i.e. 500-600 m2 or greens to 450/500 m2 are often impossible on small, heavily contoured or wooded sites. Such featuring would not sit well on most of our older courses, more likely it would probably spoil the course by changing it’s character. No – the architect has to be much more sensitive to the course than that. from a ﬁnancial or disruptive point of view. Depending on the extent of the project, the ideal time for construction is late summer when ground conditions are favourable, though of course it assumes no play on the works in question until the following year. In terms of a timetable the works should be undertaken in one or two years. This may not always be possible but if works are extended much beyond ﬁve years or so, the membership will inevitably suffer from construction fatigue and as a result the works may not be completed at all. Once a timetable has been established it needs determination to see it through to it’s conclusion. The disruption may take place for two or three years but hopefully the results will last for many years thereafter. Renovation of an existing course is often a difﬁcult concept to grasp for many members who are invariably satisﬁed with the course as it is and enjoy its frailties. However competition from newly designed and constructed courses require our older, established courses to review their assets and to consider renovation. 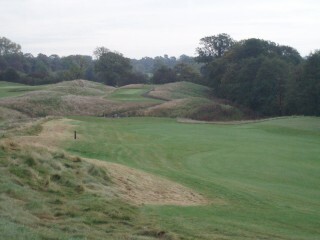 This is an opportunity for this golﬁng generation to pass onto the next a course that reﬂects modern day approach to the game that should last to the end of this century, whilst still retaining the charm and character of the original course as it was built at the beginning of the last century. From the architects point of view the art is to make these changes sympathetically and to leave one’s ego firmly in the cupboard.